That was Boston Red Sox owner Tom Yawkey, in 1967, explaining why there was no way the Red Sox would still be playing in Fenway Park by 1972. In addition to saying it would be “almost impossible to exist financially in Fenway Park,” Yawkey dropped a reference to the Braves moving out of Boston to Milwaukee, and was described (by longtime Boston Globe reporter Will McDonough) as having exhibited “tremendous generosity in all phases of his operation over the years,” which will come as a surprise to all the African-American ballplayers he refused to employ on his club. Anyway, go read it, it’s a great blast from the past. And then have a look at this. I’ve been a newspaper columnist myself, so I get what they’re for. At their best, they combine insightful reporting with the kind of personable, entertaining writing that isn’t usually allowed on the news pages. (I’m not sure that distinction will hold up in the age of blogs, but it’s been useful for newspapers.) At their worst, they’re just people who are paid a lot of money to gush opinions that aren’t any more sensible or well-researched than those held by any random person on the street, but which for some reason go out to millions of readers. But if we left all our problems to be solved by future generations, we’d still be dumping raw sewage in the Charles River. Jackie Robinson never would have gotten into Ebbets Field without a ticket. And there you have it, the kind of opinion trap that columnists all too often find themselves building and then falling into: The Red Sox continuing to play in Fenway Park is like swimming in filth and segregation. I really doubt that Buckley sat down to write that yesterday, but eventually he got to a point where he needed to figure out how to argue that the third-most-valuable team in baseball can’t live without a new stadium, just because the team’s owner said Fenway should be structurally sound for another three decades or more, but three decades isn’t until the end of time, now is it? This is the kind of logic that an editor really should catch and send back for rewrites, but opinion columnists don’t generally have their ideas rejected just because their editors think they’re screwy. Unless somebody powerful objects to it, that is, in which case it’s bound for the circular file. Some ideas are more unacceptable than others. Turns out I’m not the only one critical of the deal that the city of Boston cut to give the Red Sox perpetual rights to Yawkey Way in exchange for $7.34 million in payments over the next ten years: The advisory Boston Finance Commission has called on Mayor Thomas Menino to delay a vote on the plan, saying it will “shackle generations of Bostonians to an agreement that over time will prove to be financially irresponsible” and that the city should be negotiating to get a chunk of future revenues from concessions on the site. The Boston Globe article on this revealed that the Boston Redevelopment Authority at least had some rationale behind its numbers: Since retail space in the neighborhood goes for $60 a square foot, and the Sox would only use Yawkey Way about one-third of the days in a year, the BRA settled on a price of $20 per square foot per year. And since annual rents are usually about 7 percent of land value, and Yawkey Way is 17,000 square feet, that came to a purchase price of just under $4.9 million. Add in air rights over Lansdowne Street (where the Green Monster seats were built) for another $2.5 million, and the total price tag came to $7.4 million. This leaves out a couple of important factors: First off, Boston isn’t actually getting $7.4 million in present value — it’s getting $7.4 million over the next ten years, which is worth somewhat less than that. Additionally, one could argue that Yawkey Way should be valued at more than surrounding retail properties because it’s a unique location — it’s not like if the Red Sox didn’t like the price being charged they could just go and rent 17,000 feet of local storefronts 81 days a year in which to hold a giant open-air concessions concourse. (Though I suppose the opposite argument is true to some degree as well: If they weren’t renting to the Red Sox, the city wouldn’t have many other bidders to use the street — though it does have value as, you know, a public street, plus it’d be interesting to see what, say, a coalition of independent sausage truck vendors might have bid for the site. Anyway, Mayor Menino has signaled that he’s going to ignore the Finance Commission and let the Yawkey Way easement proceed. But it’s a reminder that, even if the deal is better than the original one — which was crazy low because, according to the Globe, a real estate consulting firm based the Sox’ rent on “lease rates for pushcarts in shopping malls” — there’s still reason to believe that Boston may well be leaving money on the table in order to keep the Sox happy. The Boston Red Sox have cut a new deal to lease Yawkey Way — the street outside Fenway Park that they use as an open-air concessions concourse — from the city of Boston on game days. Under the new plan, instead of paying a yearly rent, the Sox will pay $734,000 a year over the next ten years to buy a limited easement on the street, after which it will own the rights and pay nothing. That’s better for the city than the $186,000 a year that the Sox have been paying, albeit not all that much better, since after the year 2023 they’ll be able to use the street for nothing, forever. And considering that the team brings in an estimated $5 million a year in additional revenues from using the street, $7 million and change over a decade is still a relative pittance. So, crappy negotiating by Boston Redevelopment Authority director Peter Meade, who’d initially indicated that he’d seek a cut of Red Sox revenues from Yawkey Way, but instead decided to go for the “predictable revenue stream.” There’s some logic in that, but in either case the question is why Meade agreed to give up use of a public street for about 10% of its value to the team — especially when the Red Sox’ only option if Meade demanded more would be to lump it. Red Sox president Larry Lucchino seemed to have that in mind with his statement: “If you’re looking for a short answer to ‘What’s in this for the city?,’ one answer is the preservation of Fenway Park.” So, if Boston had demanded a more equitable lease, the Red Sox were going to what, walk away from their hundreds of millions of dollars in renovations to Fenway and move out of town in a hissy fit over whether to cut the city in on sausage profits? Explain that again, Larry? “It’s unlikely that if we were not able to make the kind of improvements that these two projects represent that we would have found a viable way to stay there,” Lucchino said. So, double negative, past tense subjunctive, and we get … I think something involving Lucchino threatening to go back in time and kill his own grandfather. Phew — sure am glad we avoided that! While it’s certainly worrisome to have a newspaper and the sports team that it covers share ownership, it’s hardly unprecedented: Not only did the Chicago Tribune own the Cubs for years, but the Times itself owned a share of the Red Sox for years while it owned the Globe. (Former Globe sportswriter Gordon Edes says, “I think this is different. This isn’t the newspaper owning the team. This is the team owning the newspaper.” Which doesn’t really seem all that different to me in terms of conflict of interest, but okay. *) And in any case, it doesn’t take shared ownership for a newspaper publisher throw his weight around on behalf of the local team, as we’ve seen both recently and not so recently. If nothing else, it’s going to be interesting to see whether every baseball story in the Globe from here on out has to refer to “the Boston Red Sox (owner of this newspaper).” And, of course, whether it’ll still run occasional articles like this. *UPDATE: Dean Starkman at CJR argues that “sad to say, the conflict of a baseball club owning a newspaper is even more acute than a newspaper owning a ball club. In the latter case, the newspaper was the more valuable asset and its very value at least provided an incentive not to take too many risks with the paper’s reputation. 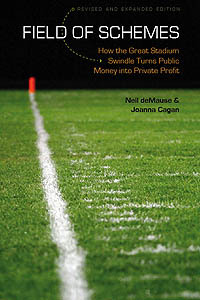 The incentives are reversed when the ball club is many times more valuable than the paper.” Maybe, though the fact that so many sports leagues have tried to turn their websites into semi-independent journalism outlets is at least somewhat heartening — it appears that the fear of independent competition is the main factor keeping owners from turning their papers into total shills for their corporate interests, and there are still some non-Red-Sox owned news outlets in Boston. More every day, in fact! The other stadium is remembered today by a photo gallery of what you’ll never see again. No mention of Detroit’s own stadium diehards who kept Tiger Stadium alive for a decade past when ownership wanted it gone, but then, history belongs to the victors. As a personal note: The two are among my absolutely favorite ballparks that I’ve visited, for very different reasons: Fenway has its bizarre dimensions, the fascination of the Green Monster, and its unique (even for when I was growing up in the 1970s) single-decked structure, though its roof deck has slowly grown to make it more of a 1.5-decked building in recent years. Tiger, meanwhile, had a history even longer than Fenway’s (the site known simply as The Corner had been home to pro baseball since the 19th century), the famous overhang in right field that allowed fans to catch home run balls that otherwise would have landed in outfielders’ gloves, and most of all, an upper deck that was so close to the action that spending one inning there put the lie to claims that “intimacy” is solely the province of new stadiums with high-priced seats right next to the batter’s box. Here’s what I wrote in 2009 as a judge considered a last-ditch effort to save part of Tiger Stadium from the wrecking ball. The effort failed, and the city of Detroit went ahead and completed demolition (though a band of baseball diehards still cuts the grass and plays pickup games on the old field, against city orders to leave it overgrown and unused). But I’d say the same today: Though Fenway Park (and Wrigley Field) remain historic baseball treasures, something of the baseball experience was lost with Tiger Stadium that will never be regained. Yuh-huh. The paper then goes on to cite some of the rumored changes that it had previously reported (more ad signs behind the bleachers, street closings for fairs on game days) and some it hadn’t (“‘gateway’ archways that welcome people to ‘Wrigleyville: Home of the Cubs’ from various directions”), none of it attributed to any source. In 2000 — before the Henry/Werner group bought the team — the state legislature had approved spending more than $300 million on improvements around the park as part of the then-owner’s plan to build a new stadium. That plan fizzled, and with it the public funding, but now Henry, Werner, and Lucchino wanted to either revive the state’s financial incentives package or quietly win a new round of funding. The finesse with which this had to be accomplished could not be overstated. There were some around the table at these meetings who argued vociferously to simply tie the Fenway Park commitment to public funds. In other words: “We’ll only stay and renovate Fenway if we receive taxpayer assistance for infrastructure improvements.” [Larry] Lucchino overruled them. The Red Sox would make the commitment to Fenway Park regardless of the infrastructure issue. Gradually, a media plan emerged: The team would guarantee that baseball would be played in Fenway on its 100th anniversary in 2012; highlight all of the money the new owners had already spent — and were going to spend — on improving the park; and extend an offer to help the state with infrastructure improvements. Implicit in that offer, of course, was that the state would kick in money, too. The whole thing was going to be laid out at a press conference at Fenway on March 23, less than a month before the start of the 2005 season. It was a solid plan and might have gone off without a hitch, but it was nearly sunk when an overeager associate decided to give an exclusive advance to Globe columnist Joan Vennochi in a wrong-headed attempt to win some positive press. Joan is a friend of mine and a true baseball fan, but she is a fierce opponent of public financing for professional sports teams. In fact, she’d been one of Kraft’s most dogged critics during his quest for taxpayer money to build a stadium in Boston. When the paper hit the door that morning, you didn’t even need to read the column to know what it said. The headline told it all: “No Public Money for Red Sox.” It would take months to recover from that blunder, which seriously set back the club’s plans for taxpayer support. In the end, the team got less than $100 million. How seriously to take this story is hard to tell: The Red Sox owners’ announcement of staying put at Fenway came off the next day without a hitch, after all, and it’s not like Vennochi had had much success derailing earlier plans for public funding for a Red Sox stadium. (Bailey also gets the amount of the originally approved state subsidy wrong: It was $100 million, not $300 million; an additional $212 million in city funds was proposed but never approved.) Still, this is at least some indication that John Henry and Co. were planning to ask for more public subsidies for a Fenway renovation if they could get it — which, given Henry’s actions as owner of the Florida Marlins, really shouldn’t come as any surprise. To his (and Lucchino’s) credit, he backed off once it proved politically impossible, and went ahead with the renovations anyway — though given that he was able to, it’s worth wondering why the state of Massachusetts should have been chipping in to pay for it in the first place. Over in Wrigleyville, the Cubs say they are hamstrung by a City Council decision to give landmark designation to parts of 97-year-old Wrigley — including the marquee, ivy, scoreboard, and bleachers. Not only does the local distinction not come with federal tax dollars, but the Cubs say the landmark status is a factor in their failure to follow the Fenway rebuilding model. Of course, the national register isn’t actually landmark status (which Fenway doesn’t have), and Chicago landmarks law doesn’t actually prevent renovations so long as “historic” architectural features are retained, but why ruin a good story? Though it does take away a bit from the contrast between the two teams when the Times reveals that “the Cubs have discussed a listing in the National Register, but will not pursue it until after Wrigley has been renovated” … in other words, just like the Red Sox did. As for the $80 million the Red Sox will reap in tax credits — actually more like $50 million, given that more revenues for the team also means bigger revenue-sharing checks to the rest of MLB — that’s undeniably public money, but not actually a special subsidy, since it’s a tax credit that anyone can avail themselves of if they’re rehabbing a landmarked building. Whether you think historic preservation credits are a good idea in the first place likely depends on your feelings about whether you think maintaining historic buildings is a public good — I’d say yes, though a cumulative 40% tax credit seems a bit richer than necessary — but that’s a larger issue to take up with the U.S. Congress and Massachusetts legislature. Meanwhile, back in Chicago, Cubs owner Tom Ricketts spent $20 million this week to buy a McDonald’s across the street from Wrigley. That would fit well with a Fenway-style redo of Wrigley — the Sox bought several buildings adjacent to Fenway for office and kitchen operations, though those weren’t across the street from the stadium as the McDonald’s building is from Wrigley. Still, it looks like Ricketts intends on spending some more time trying to squeeze some stadium cash out of the city of Chicago before he commits to anything like that.